Is this revolutionary tweakery from Russ Andrews just science fiction? If there's one thing we have come to expect on a regular basis in audio, it's surprising new products from Russ Andrews Accessories. The Lancashire purveyor and inventor of all manner of tweakeries seems to have an inexhaustible fund of previously untried ideas for bits and bobs to improve our sound systems. This little device appears as a small plastic box with two flying leads, each terminated in piggy-back banana plugs (spade terminals available as an option). You plug them into the back of your loudspeakers, then plug the speaker cables into the back end of the plugs. The claim is that the Zapperator absorbs radio-frequency interference which is picked up by the loudspeakers, reducing noise 'in the amplifier/loudspeaker interface'. Andrews isn't enormously forthcoming about the precise configuration of the circuit in each Zapperator, describing it simply as a 'high quality Zobel network'. A Zobel network can be various things, but in audio it's usually a simple network consisting of a resistor and a capacitor in series, connected between the output of an amplifier and ground and intended to help stabilise the amplifier at high frequencies. The Zapperator circuit is encapsulated in black resin, but we were able to see and identify a few components, including a resistor and a couple of capacitors, all apparently normal industrial parts. What we can't see is how the Zapperator can either absorb or block very much RF. Andrews claims that loudspeakers can act as an RF antenna and, to the extent that they include some lengths of unscreened wire, that's certainly true. In order to absorb this, the Zapperator would have to present a low impedance at radio frequencies, but its impedance is, in fact, moderate. It will cut interference levels a little, but not massively. We tried the Zapperators with various combinations of amp and speaker, the speakers being from ATC, Spendor and Bowers and Wilkins, while amplifiers included a Cambridge Audio Azur 840A, Exposure 3010 and various more or less current models from NAD, Harman/Kardon and EAR. Cables ranged from Kimber and Wireworld to QED and various custom configurations. The first thing we would like to make clear is that in no case did the Zapperators make the sound worse in any definable way. On the other hand, most of the time we were not convinced that they made much of a difference at all. To the extent they did, they seemed to give rise to small changes in tonality and imaging – the former typically became the minutest shade mellower, while the latter simply shifted a little: a bit like moving the chairs of an orchestra a couple of feet one way or another. Perceptible, yes, if one listens in quick succession to 'before' and 'after' conditions, but not necessarily an improvement and not really important either, as both versions were plausible and enjoyable. We would hesitate to dismiss the Zapperator as wishful thinking or placebo effect, but we can't get very worked up about its changes in any of the various systems where we tried it. In addition, we don't necessarily accept that radio-frequency interference is the only explanation for its effects. The much discussed concept of 'impedance matching' could also play a part, making the combined load of cable, speaker and Zapperator look less threatening to the amplifier at frequencies high above the audio band. 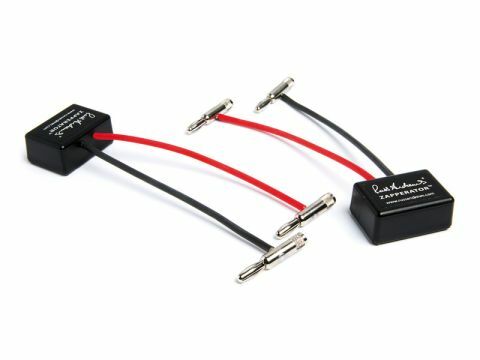 Various experiments have suggested that RFI is more of a problem in common mode, which is not affected by the Zapperator in any case – ferrite clamps are more applicable here.